From mobile video to HD - we transcode your media into many different formats and always in the best possible quality. Easily blend player within your site. Player supports both audios and videos and has link to RSS feeds and more. Supports both audio and video podcasts. Control your presence in iTunes. Automatically generates RSS feeds and a public page URL - works from Iphone too. 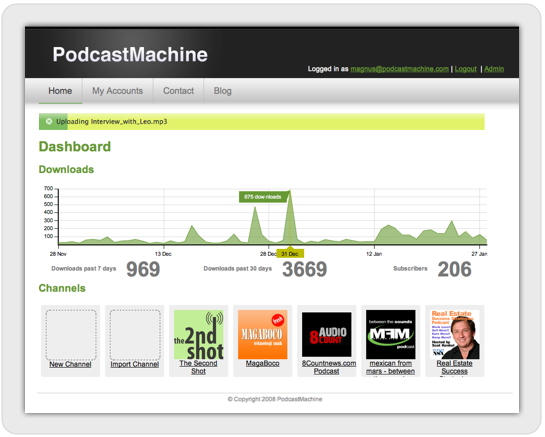 Upload, publish and manage your videos and audios with just a few clicks of your mouse. Easy workflow. Sign up and get going in a matter of minutes. If you need assistance, visit our helpdesk or look in the forums.